At first thought, I was overwhelmed to think about which room to draw. There is so much going on in every room of our house. 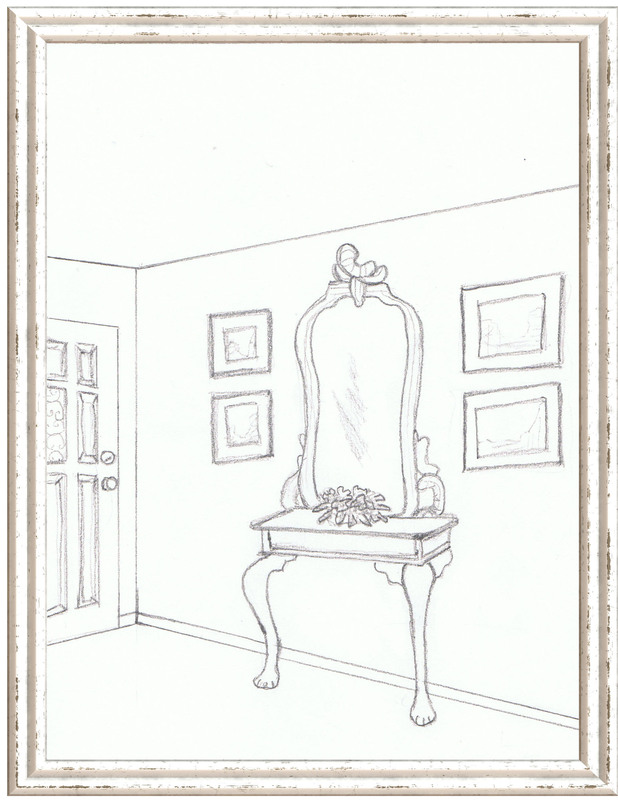 Then I got it – draw the Foyer! To put it nicely, our home decor would be “eclectic”, except for the foyer. DH’s grandfather was an antiques dealer in Rome. He grew up amongst real European antiques, and now has a slight aversion to it. So, when we got back to the States, and I happened on this mirror/console in an antique store, I loved it, but wasn’t sure he would like it. I took him to see it, and he replied “if it sings to you, get it”. So, I did, and it now graces our foyer. It is flanked by four Canaletto prints that belonged to his grandfather (I did not attempt to sketch those).